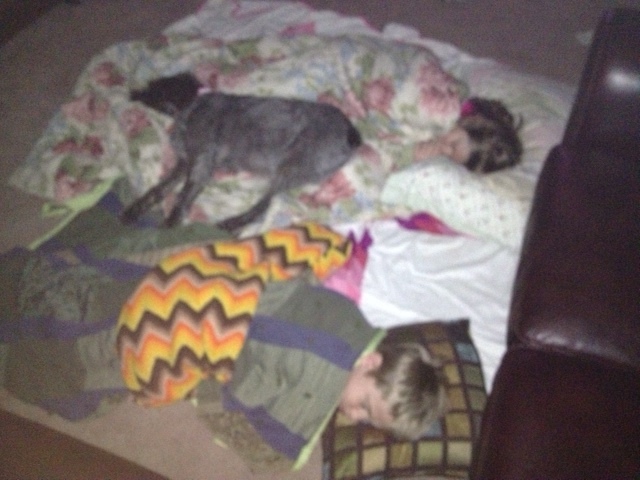 It has been a very busy summer of work, family, travel and dog training here. Sorry that I have not had a chance to keep you all updated, with the kids all at home with me, it makes it challenging to find the time and quiet space to do it all. I suppose it would make the most sense to me to work backwards chronologically with the news. 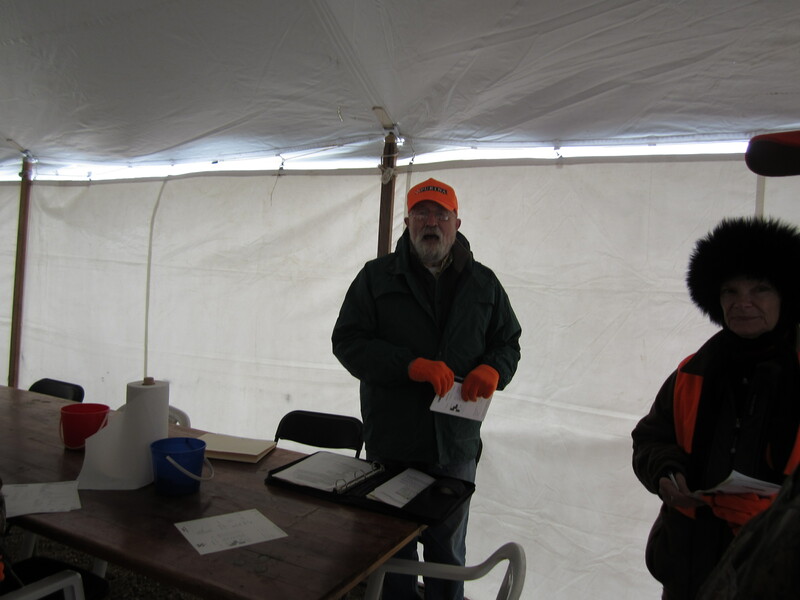 On Friday we will be traveling up to Sioux Falls, SD to run Sam and BB in the NAVDHA Utility Test at the Fall Test of the Midwest Tri-State NAVHDA Chapter on Saturday. They have been doing well in practice and I’m hoping that they both prize. Some folks grumble about whether they get prize I, II or III, but it is one day in the life of a dog. If the dog is having a bad day, there is something in the environment that they don’t like, the conditions are not what we are used to, etc., etc., the dog might not get the prize we want. 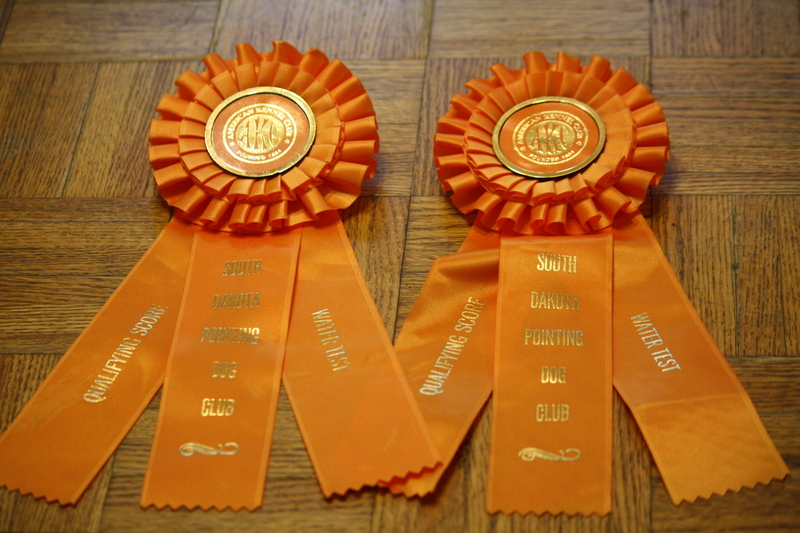 In the recent issue of Versatile Hunting Dog, NAVHDA’s magazine, two of my most respected dog training mentors ran dogs in UT and NA and didn’t prize at all. These are folks who have been doing this way longer than we have, or most folks I know have, for that matter. 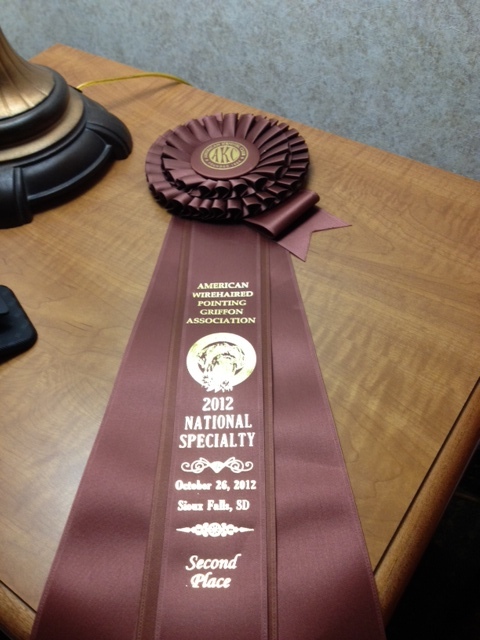 We don’t reach some sort of state of dog perfection and never have a bad day or a bad score. 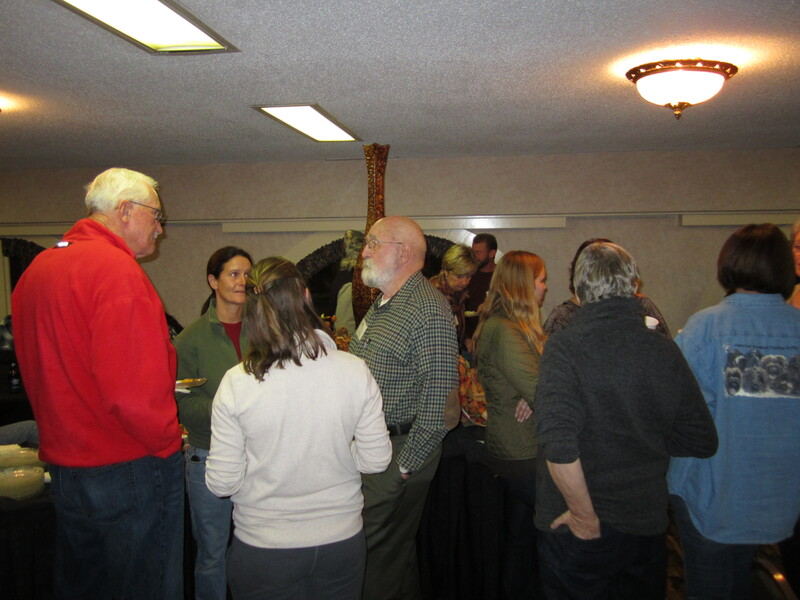 So any and all NAVHDA prizes are celebrated here! 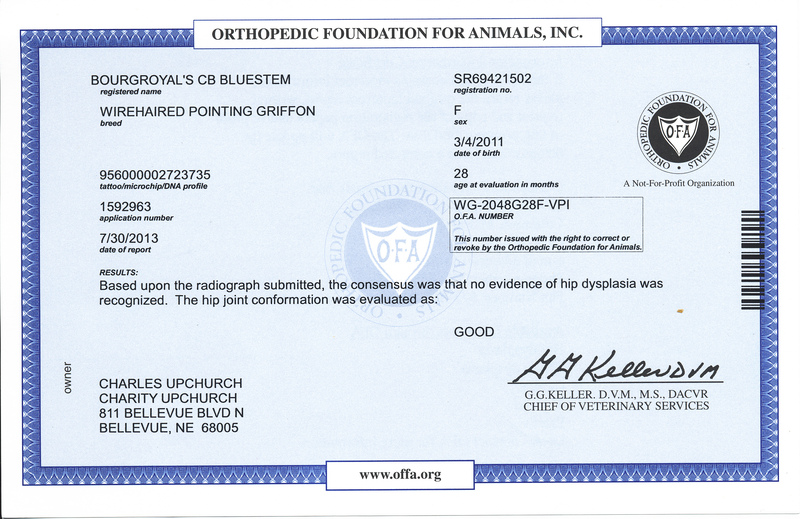 BB’s OFA hip certificate came in the mail while we were on vacation, so she will be ready to be bred sometime around the new year. We are still working out who we are going to use as a stud, so we will be sure to keep you posted. 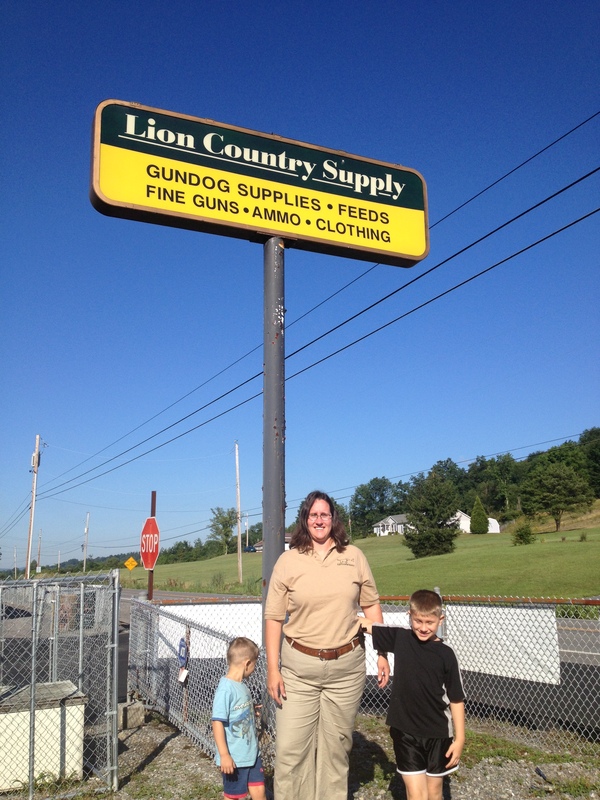 While we were traveling, I spent the day in the Lion Country Supply office. Right now, I am in the process of updating their catalog of over 2300 dog training supplies. It was cool to meet the people and see the facility. 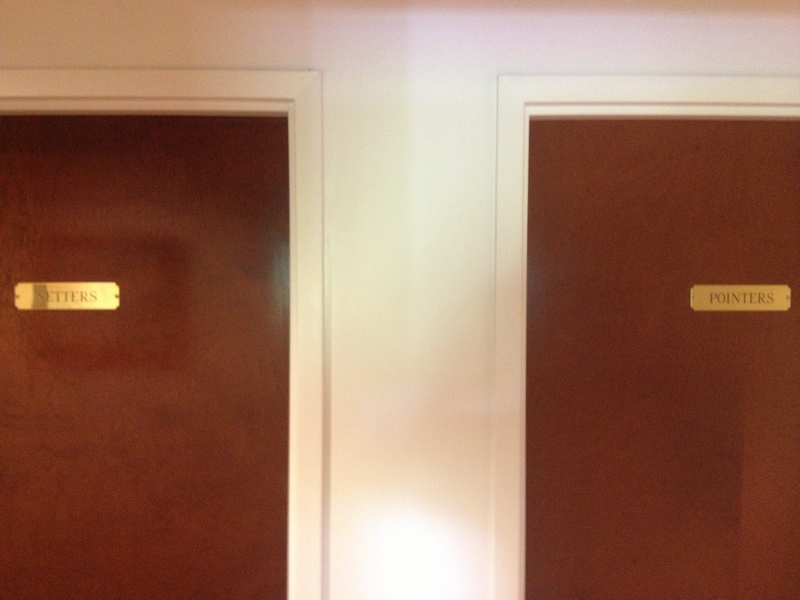 My favorite part of the office was the gun dog humor found on the restroom doors. 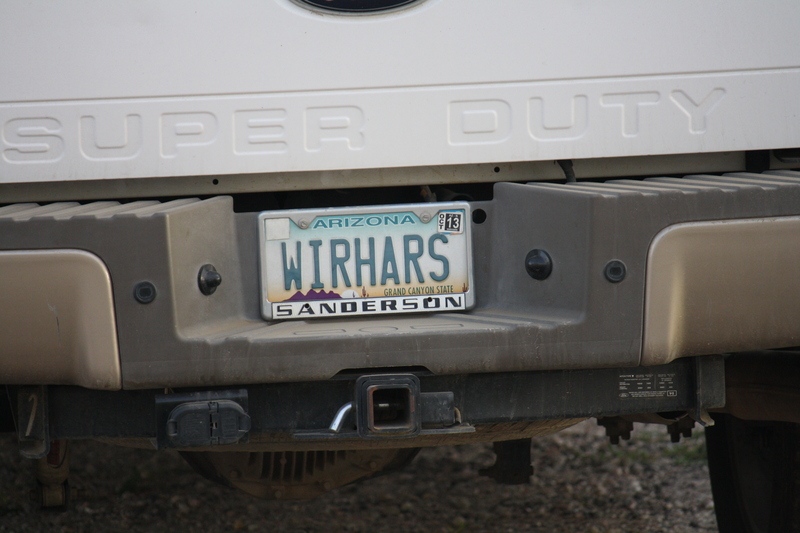 Instead of Women and Men it was Setters and Pointers, ha! The kids dropping me off at the office. Before we left for vacation we were training every chance we had! Every weekend was spent on trips to the pond and field. 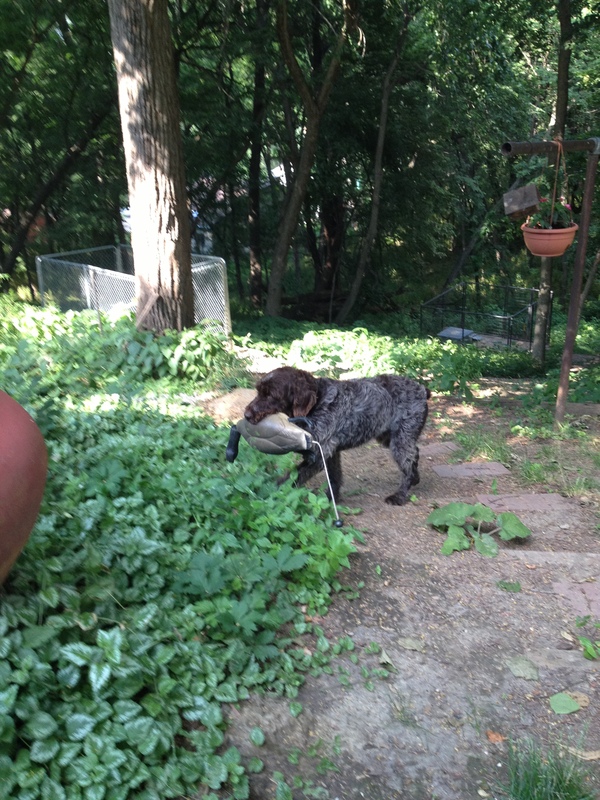 Even when we were sitting around the backyard, we were practicing blind dummy retrieves and “whoa”. 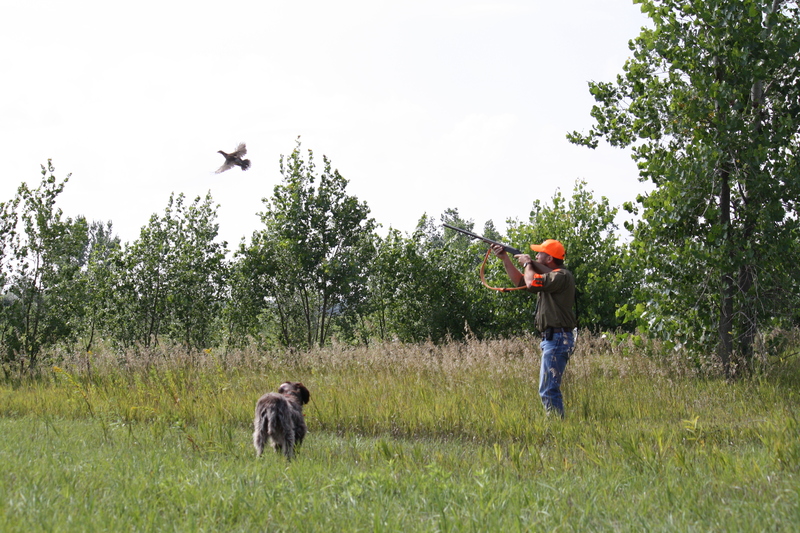 I suppose I should explain a blind dummy retrieve. That is where the dogs have to stay in the yard on “whoa” and one of us goes way back into the woods and hides the dummy without them seeing where we placed it. 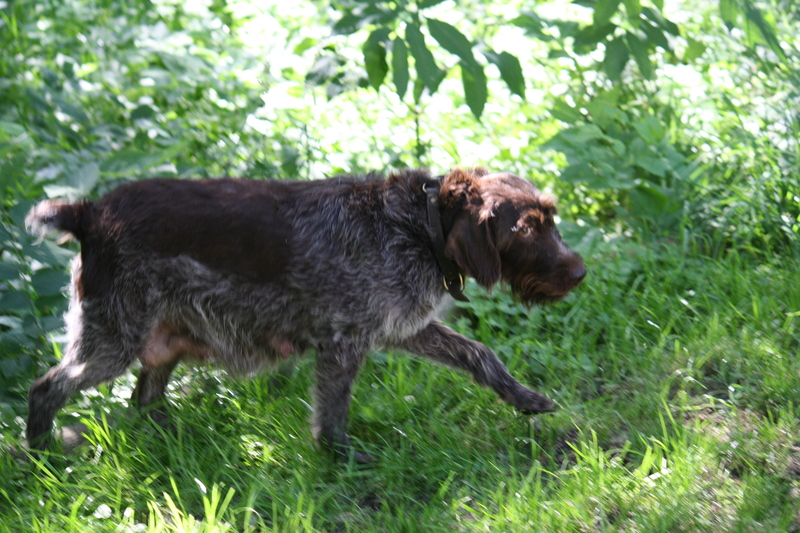 One of the dogs is then released to go fetch the dummy. 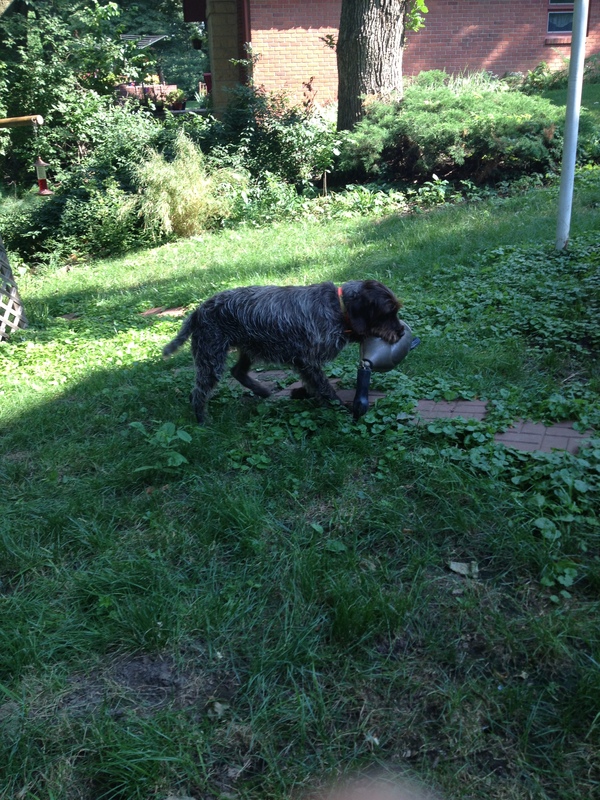 The dummies are not scented and the dog is only finding them by sight, which is fairly difficult for them. 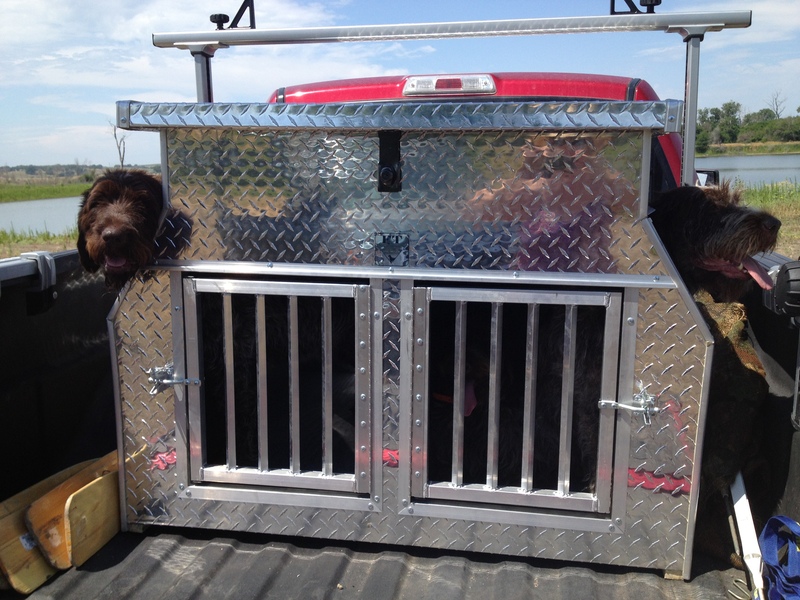 We had a cool new dog box shipped out to us from Michigan. It is a hound style box and the dogs have lots more room and are able to stick their heads out of the side of the box. 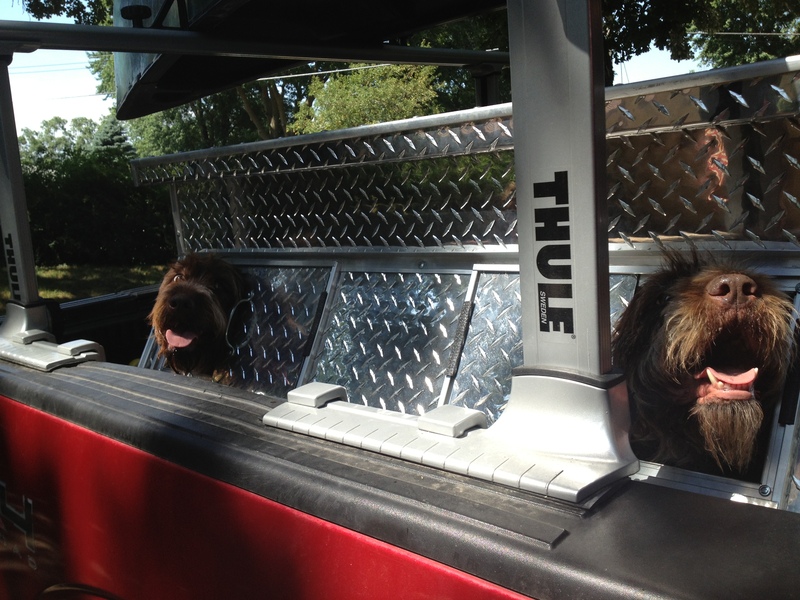 It will make the long distance trips much more comfortable for the dogs and we are glad to have finally retired the “slave ship”. It was a nice enough dog box, but it just didn’t have enough room for multi-day roadtrips. Well that pretty much sums things up for the time being, I will be sure to update you all next week as to the outcome up in Sioux Falls, keep your fingers crossed for a good Saturday for us! I am still running behind on returning voice mails and e-mails, so I apologize to those of you who have reached out to me and I haven’t gotten back to you. I have dedicated time set aside this week to get caught up before we head north on Friday. Talk at you next week! Oh and hunting season starts in two weeks! Woot! By popular demand, I need to update you all on how Sue is doing! She is very heavy, but is still living outside for a little while longer. She and BB were sharing a kennel while Mae was on a strict diet after her puppies left, in order to get her teats to retract, but I recently moved BB in with Mae by the request of Sue (plus Mae is doing fine on getting back into shape). BB is still very puppy and likes to play, so Sue was getting tired of that business. She is still taking walks twice a day, but is moving much slower than everyone else and eats and drinks double her normal rations. We have houseguests over the Memorial Day weekend, but after they are gone I will be moving Sue into the house for monitoring. I suspect that she will whelp the first or second week of June. 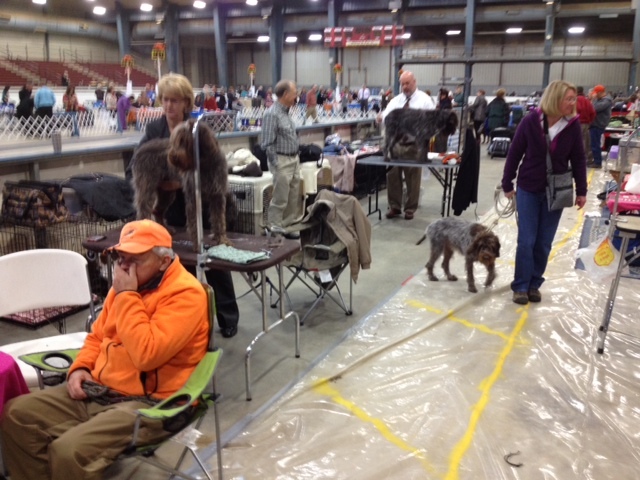 Last weekend was the South Dakota Pointing Dog Club’s AKC Hunt Test in Sioux Falls, SD. 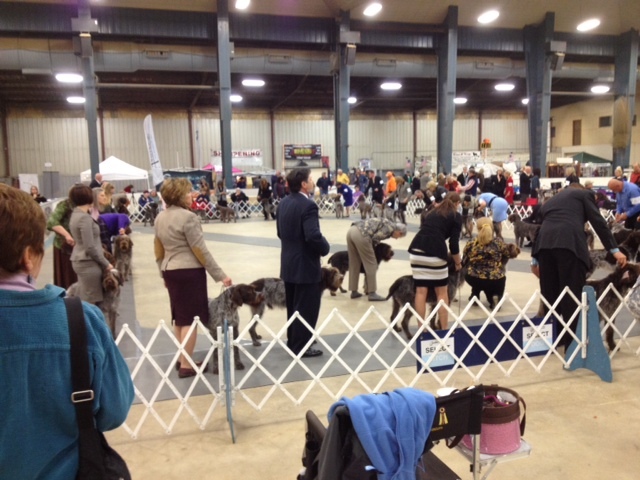 The organizers are actually the Midwest Tri-State NAVHDA Chapter, who takes on that name to put on AKC Hunt Tests. 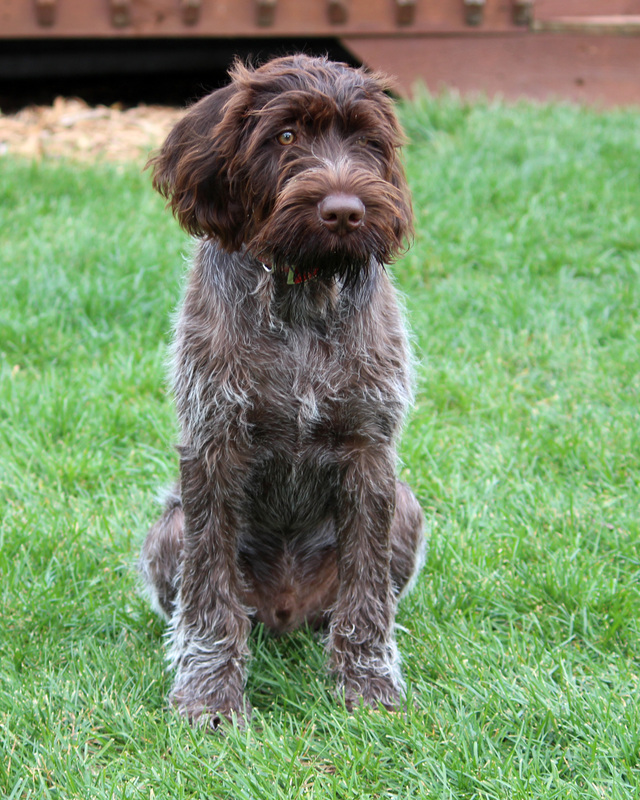 As there were a number of other griffons entered by fellow breeders that we had only visited with online and over the phone, we decided to go ahead and enter BB and Sam into the Senior Hunter Test even though we were unsure if the dogs were prepared. 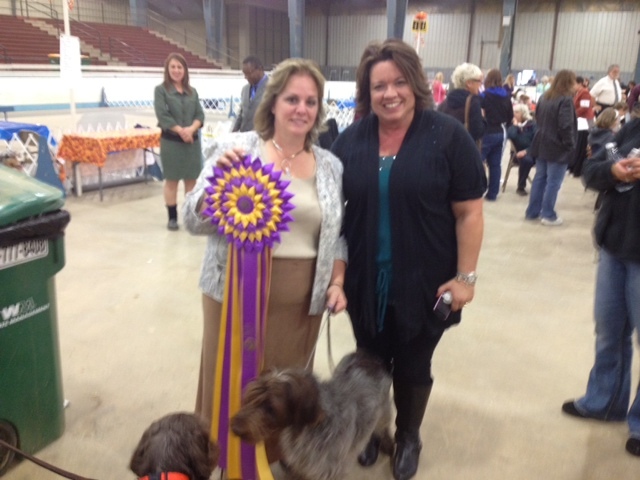 We also entered the AKC Water Test, which is a requirement for the Senior Hunter title for the Spinone Italiano and German Wirehaired Pointer, but not the Wirehaired Pointing Griffon (even though it should be). 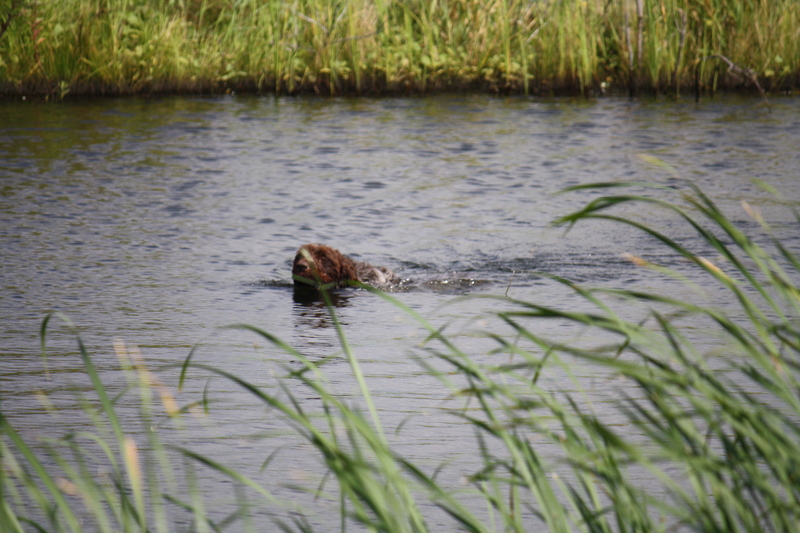 As I had all three children there, I did not anticipate being able to see anything worth taking pictures of, but as it was a hike to the pond, the organizers had me assist in handling the two dogs while our fellow testers kept an eye on the kids back at camp. 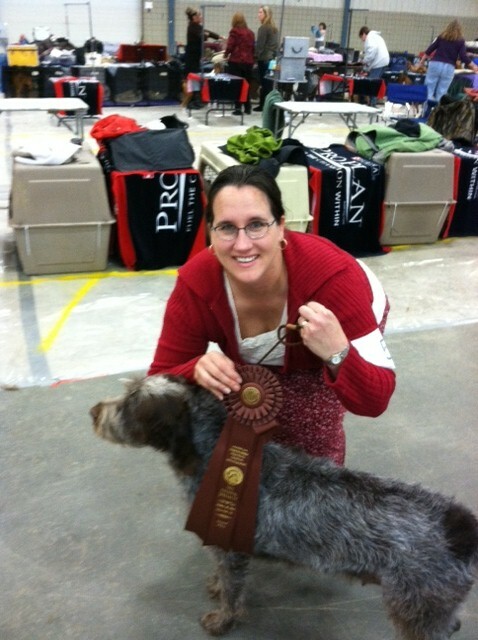 I wish I’d had my video camera, because Sam and BB both did fantastic. 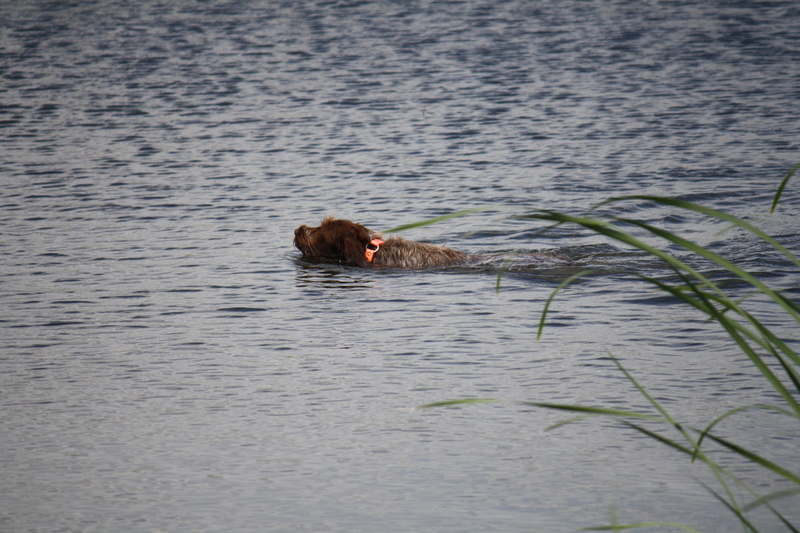 It is a basic water retrieve, where the handler stands 6 feet from the bank, holding the collar of the dog. 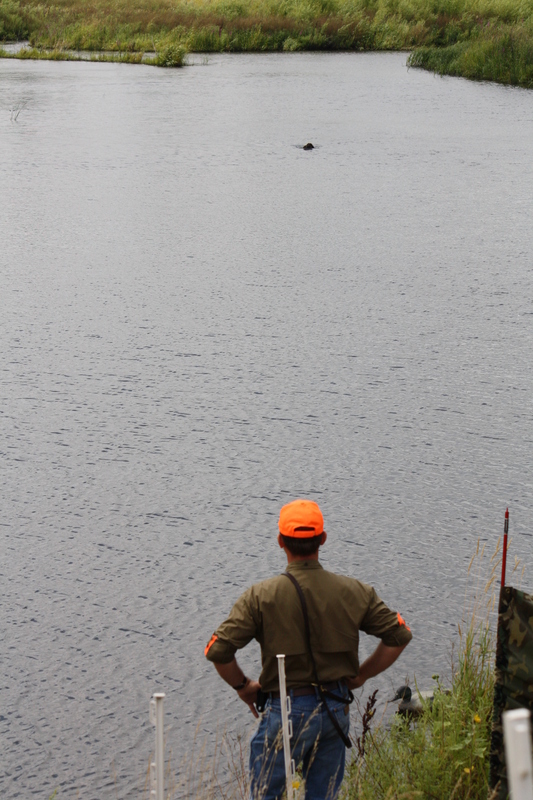 A thrower pitches a dead duck into the water and a blank shot is fired by a gunner. 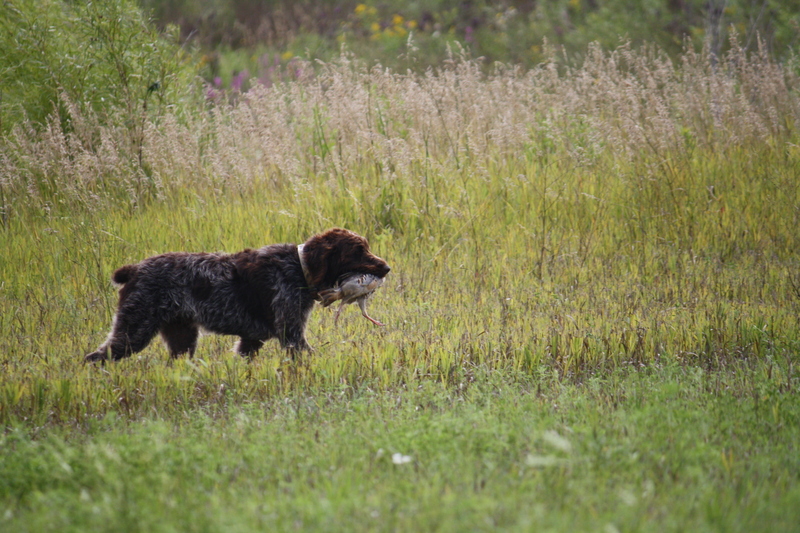 Once the duck hits the water, you release the dog and they swim to retrieve. 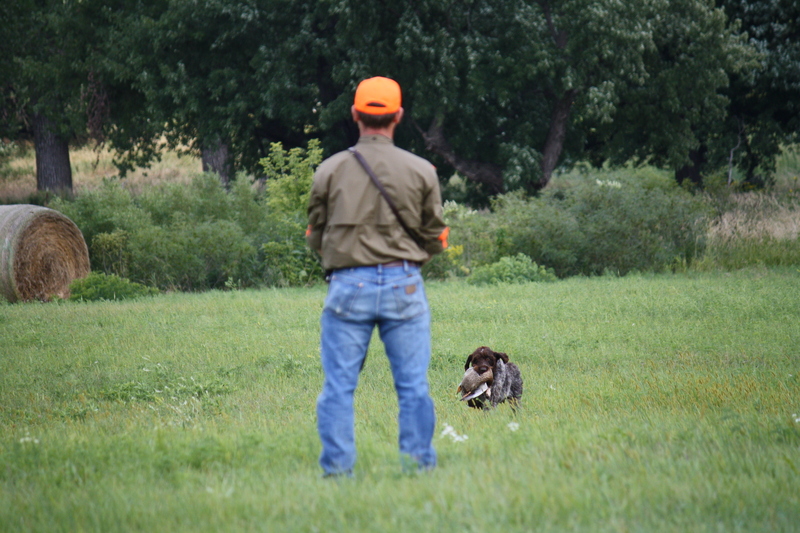 It does not have to be retrieved to hand, but can be dropped within two steps of the handler. 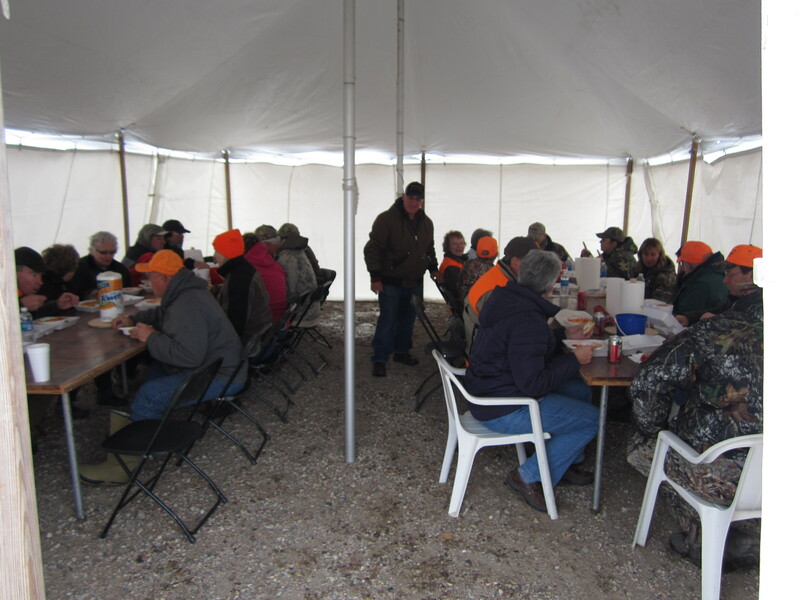 As avid hunters, one would think that Senior Hunter would be easy for us, but hunt testing and hunting are not the same thing. 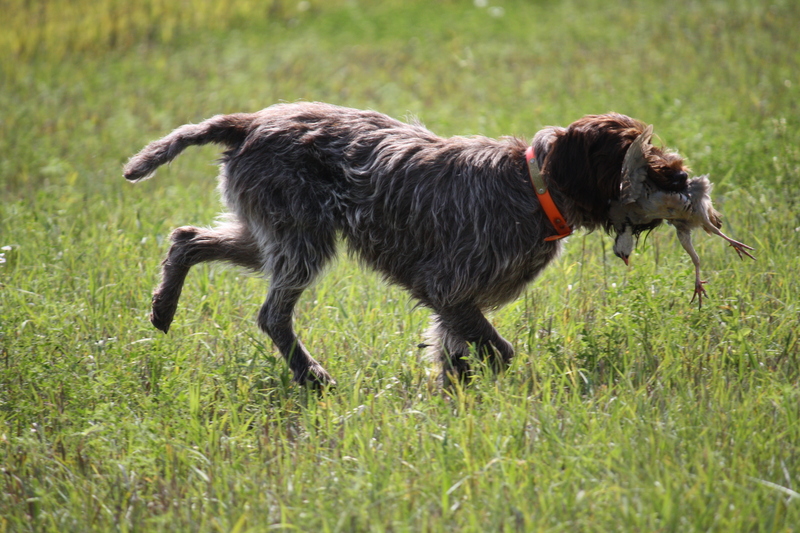 Similar to Junior Hunter, you are running in a brace with an unfamiliar dog, but unlike Junior Hunter that is only testing search and point, Senior Hunter has to be 100% steady to wing and shot (no creeping allowed at all, not a single step) and also back the other dog’s point. 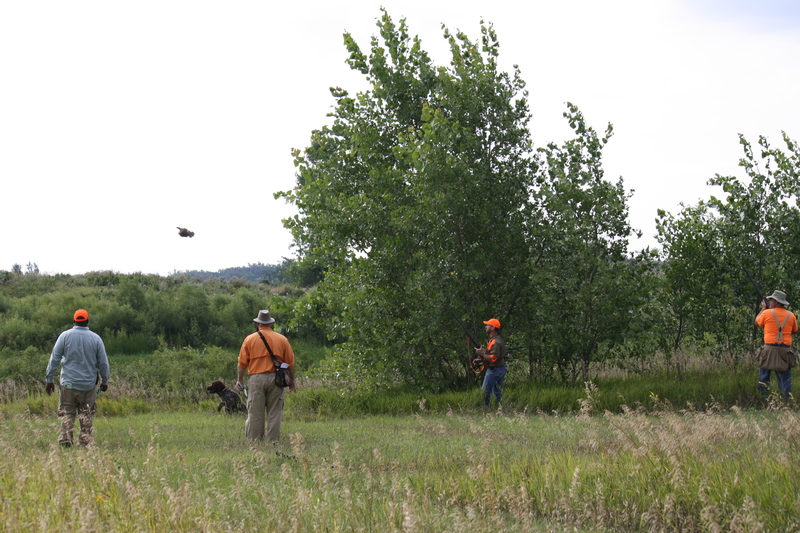 At the Junior Hunter level, the handler is firing a blank pistol at the flush, whereas at Senior Hunter there are gunners firing live ammunition and the dogs should retrieve. 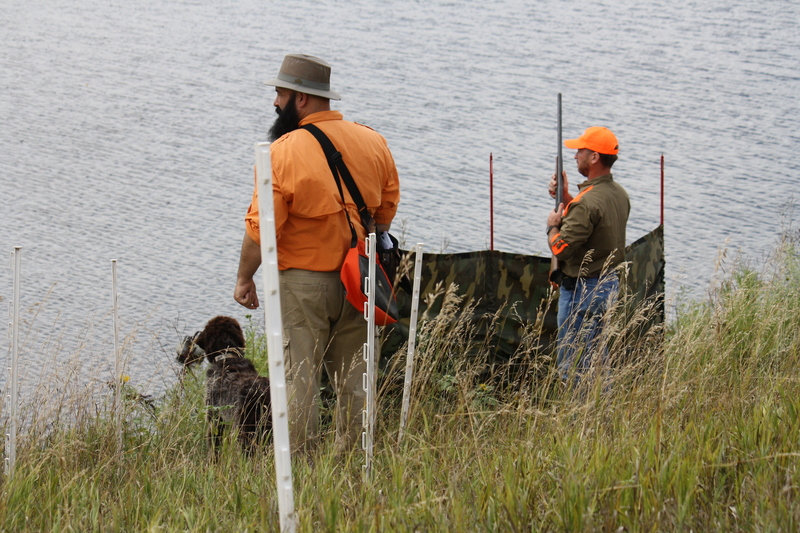 At the Senior Hunter level, you are allowed to use the “whoa” command for steadiness (which won’t be allowed at the Master Hunter level, but we’ll cross that bridge when we get there). 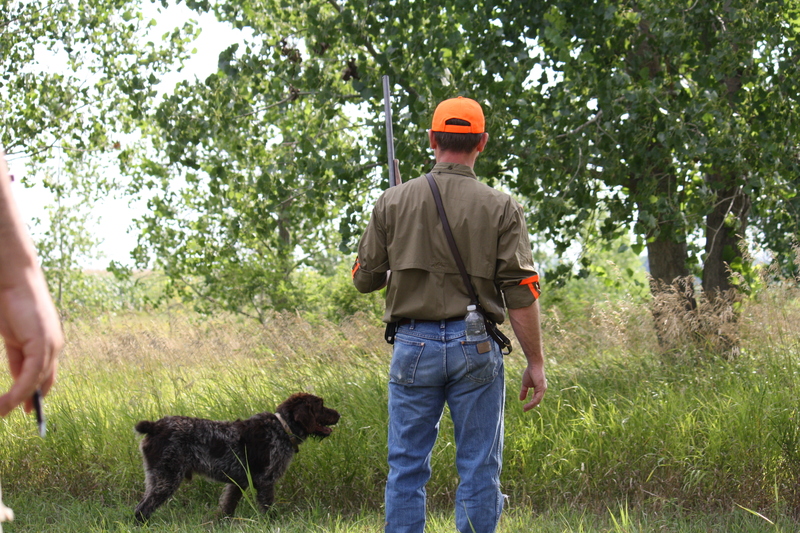 As soon as you “fail” a step in the process, the dog and handler are pulled from the test. 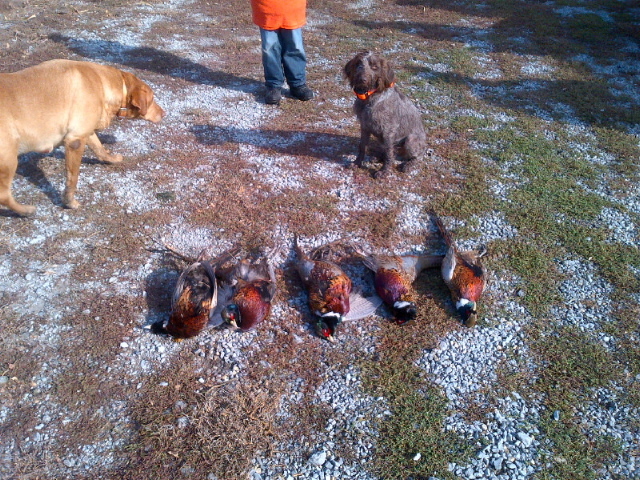 The first day, BB couldn’t help herself and busted a covey of quail. Both days, Sam creeped a couple of steps on his points. 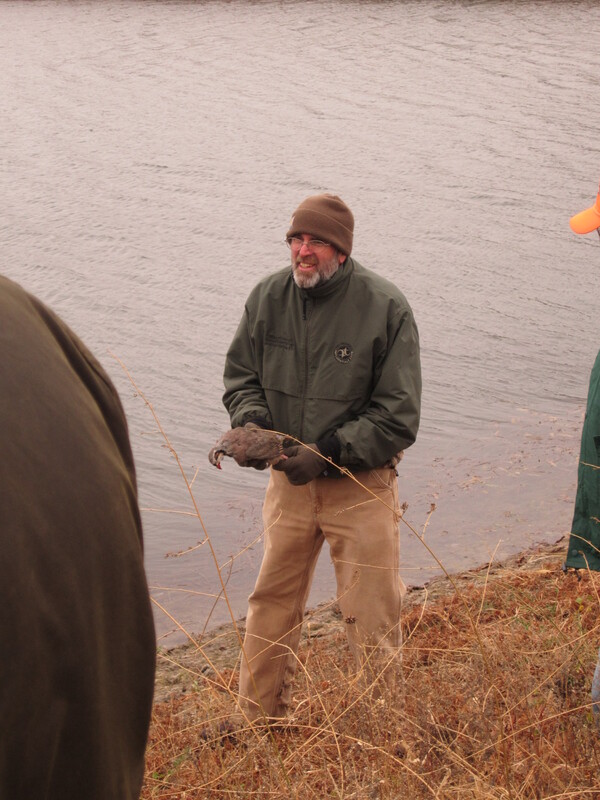 The second day, BB almost made it through the test, but of all things, she didn’t find a bird! 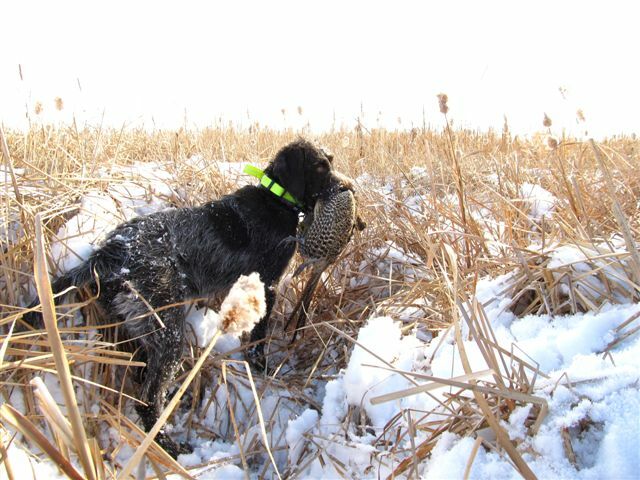 This is the same dog that found 6 birds in 8 minutes during her first Junior Hunter run. 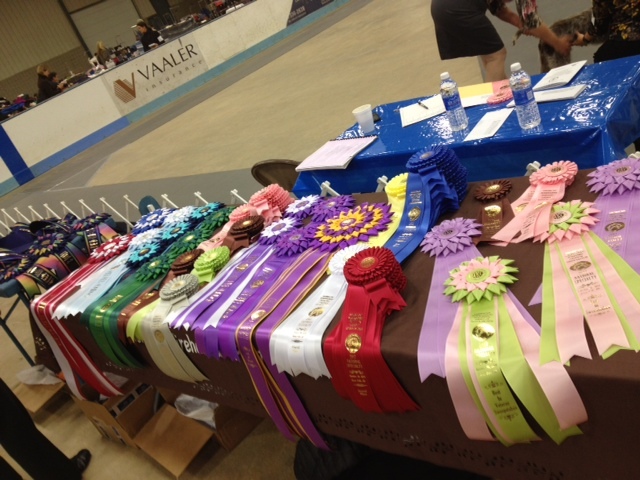 Even though we didn’t take home any SH ribbons on the weekend, it was good for us to see what is required to pass the test and what we need to work on. 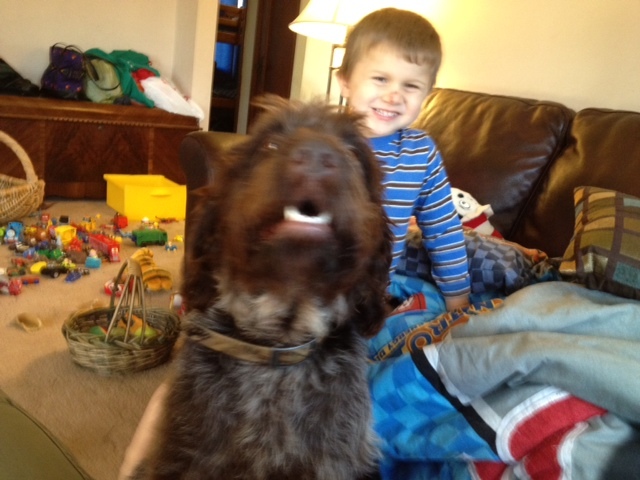 As Charles is the trainer for the big dogs (I’m puppy trainer and kennel tech [sanitation, exercise and nutrition]), he’ll be working on making the dogs absolutely staunch on “whoa”, regardless of the situation. 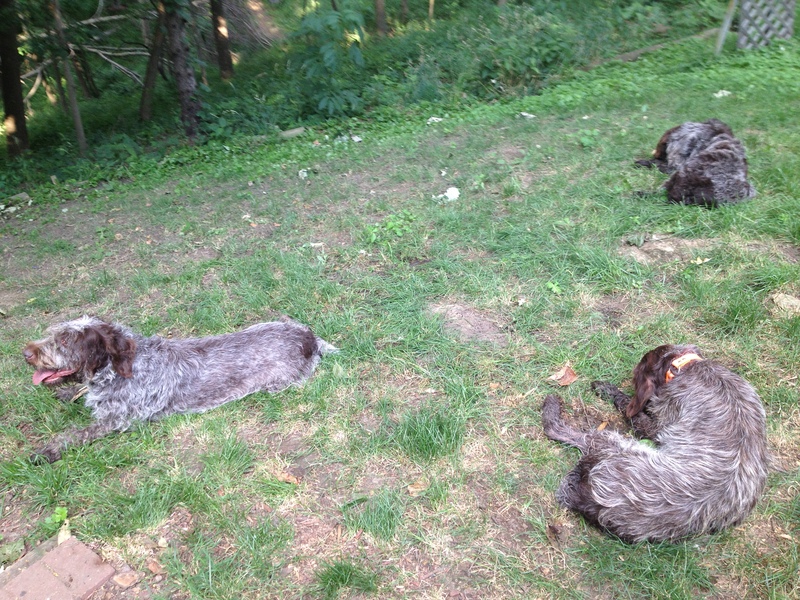 We work on “whoa” in the yard, but they are kennelmates and they aren’t working birds. 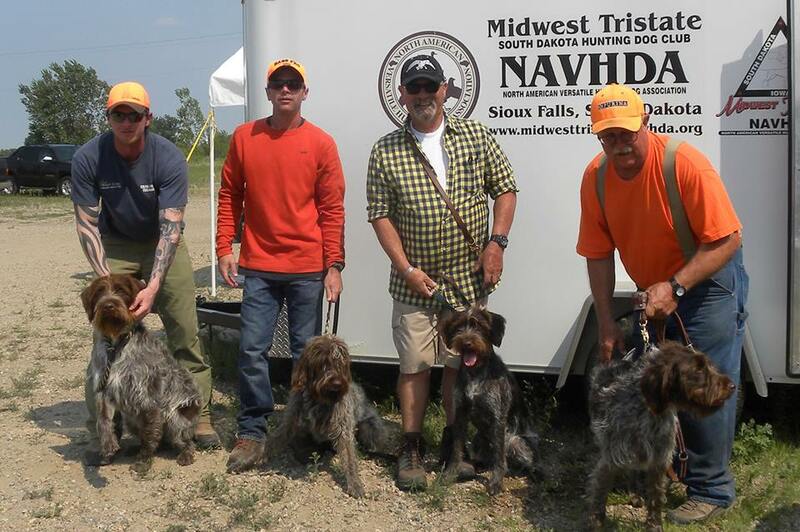 We should take advantage of some training days with the Heartland NAVHDA Chapter or the local AKC German Wirehaired Pointer Club of Nebraska so that we can attempt to replicate the testing environment with dogs from outside of our kennel. 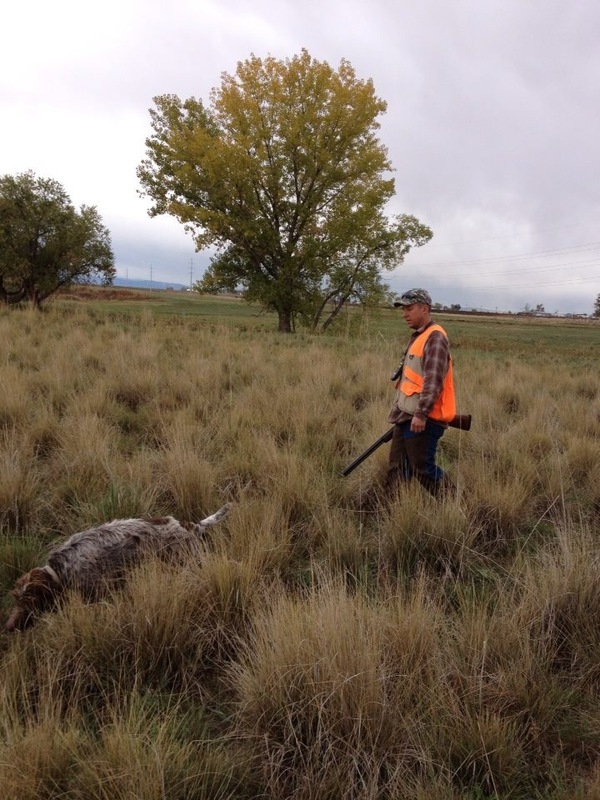 As he can use “whoa” in Senior Hunter, we are going to take advantage of that and work them towards the automatic response without command that is expected at the Master Hunter level. 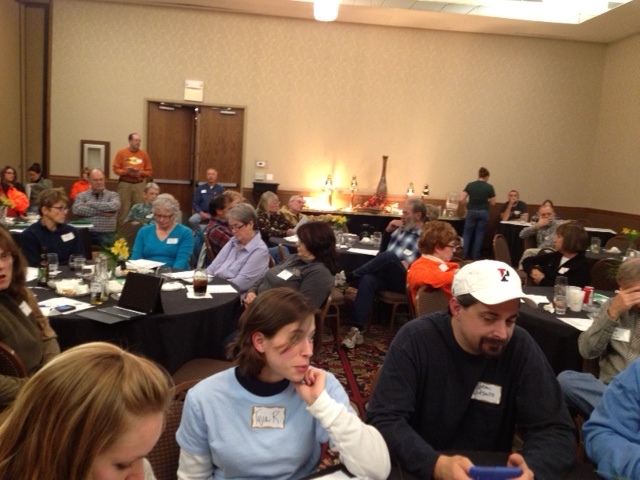 We’re still bouncing around some training ideas and absorbing the suggestions we got from other handlers and the judges. Charles got up the next morning and flew out on business (non-dog, the one that pays the bills), so we haven’t had much of a chance to talk it through. 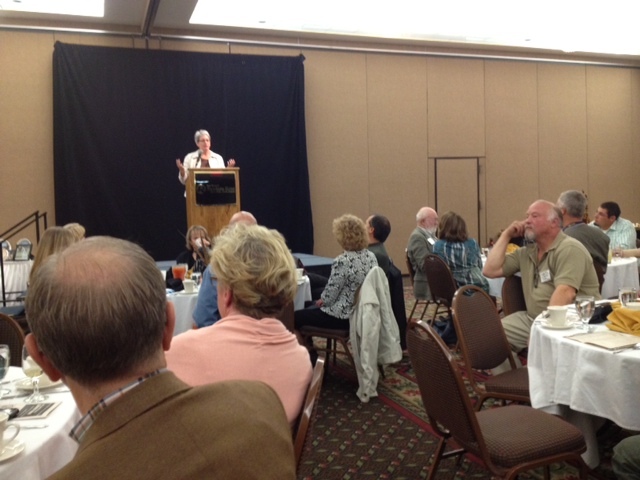 We’ll keep you posted as to what direction we go with our training and how it is working. 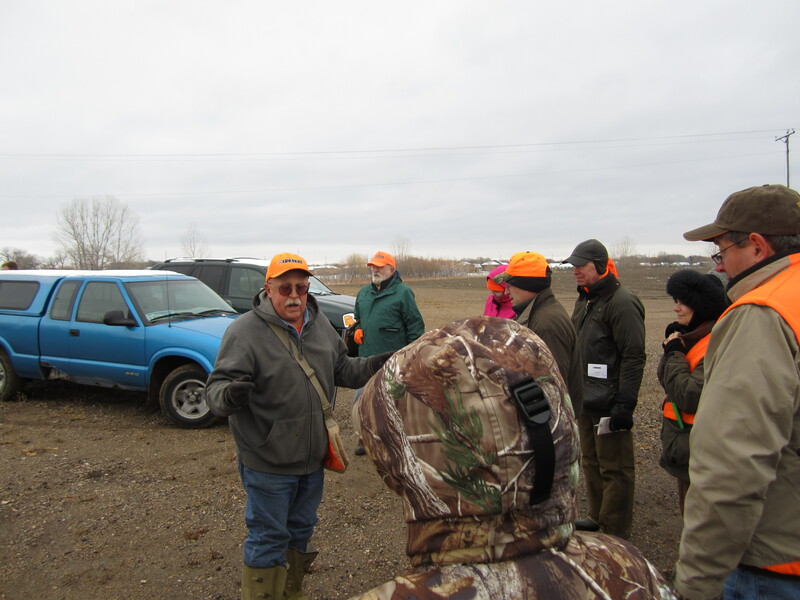 I think the absolute soonest we could get back into the SH field is at the August test in Sioux Falls, but we might decide to wait until Spring of 2013. 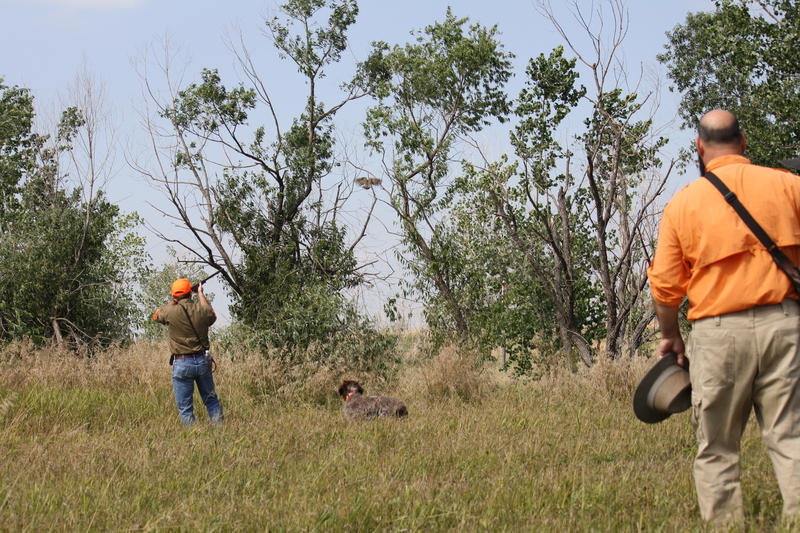 Our favorite part of the hunt testing environment is that it is fun and family friendly. 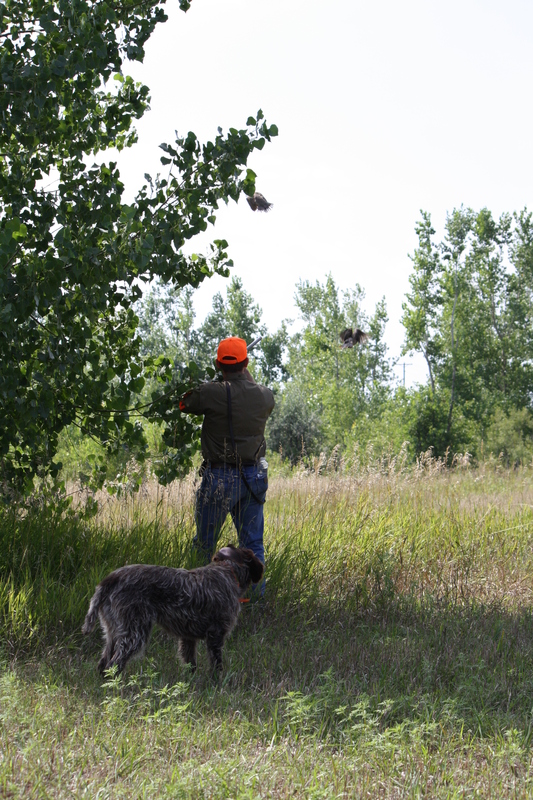 It gives us something to do with our dogs in the off-hunting season other than having puppies and keeping up with exercise. I can see that this is a hobby that we will enjoy for a good portion of the rest of our lives. We are hooked!